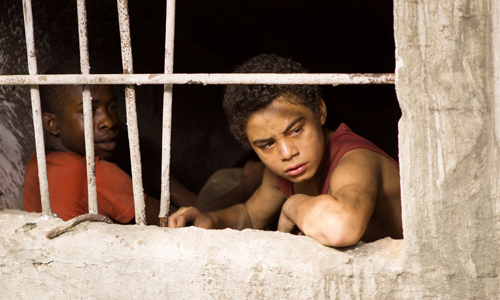 Director Stephen Daldry's fondness for building inspirational tones inside grim dramatic narratives arrives at a new destination in Trash, a thriller set against the cramped backdrop of poverty in Brazil. From the start, with the halted shot of a child pointing a gun at another individual, familiarity takes over with the tone and tempo established, unable to avoid its seemingly borrowed depiction of destitute conditions in the impoverished corners of South America. Vivacious urban music and energetic editing follow three boys as they scramble from the authorities while in possession of sensitive material, with hopes that its commentary on corruption and the value of lives will be enough to propel the suspense forward. This works, crafting an effective rush of thrills throughout the country's maze of alleyways, trains, and clustered buildings, enhanced by likable characters and their noble motivations, yet it never ditches the lingering sensation that we've experienced these exact underlying messages before. It doesn't help that the beginning of Trash, based on the novel by Andy Mulligan, requires a pretty big jump into unlikelihood, hinged on a man on the run, Jose Angelo, who managed to chuck a wallet full of crucial information directly into a passing garbage truck ... while cornered by police several flights up in a building. The happenstance exists just to get the info into the hands of Raphael (Rickson Tevez) and Gardo (Eduardo Luis), two preteen trash gleaners who live in a cluster of rickety homes in Brazil. They find run-of-the-mill stuff in the wallet that feeds their direct needs -- cash -- but they also discover other items and documents of interest, later discovering how important it all is once the police show up at the trash dump and around their homes. After teaming up with Rat (Gabriel Weinstein), a diseased kid who lives in the sewers near their living area, the trio of boys begin pressing forward to discover what the information entails, transforming into a hunt for the boys across the city to silence them before they leak their findings. Trash gathers together the bestrewn, disheveled outskirts of Brazil into a gorgeous visual presentation, where tons of plastic bottles floating in water and the cluttered homes that hover above them highlight the destitute conditions of the location without being heavy-handed. The same can be said of the sequences where the boys rifle through the expansive masses of trash near their home, which creates a fine backdrop for embracing the rough circumstances that the kids must endure. A fine chemistry forms between them as they deliberate over what to do with the wallet and whether they'll cave into the authorities, where cooperating could lead to a handsome payday and resisting could put their lives in jeopardy. Even amid the circumstances, a sly sense of humor slips into their conversations, uplifting the tone in ways that balance out the atmosphere with both the disheartening limitations of their surroundings and the personalities that continue to weather it. The purpose of Trash, however, lies in the suspense of the cat-and-mouse chase, which sparks soon after the discovery of the wallet and persists all throughout the film. Director Daldry builds tension with lucid photography flowing throughout the byzantine urban Brazilian landscape, edited together in a way that never manages to slow down. Thing is, despite the constant movement, not enough develops in the mystery propelling them forward or in the details of the materials that the boys are carrying, relying on obligatory bursts of information dumps to intermittently fill out its substance when convenient. The mechanics of the thriller feel repetitive and obligatory because of this, extending a surface-level mystery of government corruption across the span of a nearly two-hour thriller, where the dangling carrot leading to the discovery of what the information holds can only keep one enticed for so long. Ultimately, what's important is the children getting the truth out there, not so much what they're trying to get out there. To fill the gap left by the waning mystery, Trash amplifies the double meaning of its title throughout, underscoring the disposable nature of the trio for the sake of preserving the political status quo. Daldry certainly doesn't shy away from putting the boys in brutal situations, either, forcing upon them threats of torture and murder that aren't just for show, increasing the weightiness of the film's tone with each escalation of their danger. Bolstered by the caring presence of those in power to help them -- Rooney Mara's versatile NGO worker, Olivia; Martin Sheen's rough-around-the-edges priest, Father Jiulliard -- Trash finds its strength in observing whether the boys will survive their ordeal, and it's unclear if they will or won't. Does the story need a stronger reason for being than that? Maybe not, but for a film that positions itself amid heftier subjects -- brutal torture of children, crowded and corrupt prisons, and clandestine government cover-ups -- it loses some of its potency by not elevating the purpose that drives these elements forward: what would distinguish it from comparable, more potent snapshots of foreign poverty.